The synod of Livingstonia say that it has lost hope in the country’s mining deals because they are not benefiting Malawians. Project officer in the synod Paul Mvula told Malawi24 recently that it is depressing to learn that many people are still very poor in areas where mining activities are happening. He pointed out that Kanyika and Kayelekela residents in Mzimba and Karonga respectively are living a very pathetic life despite having mining sites. “Latest findings indicates that Karonga is one of the districts with the highest number of poor people likewise Kanyika where many people are now hopeless and suffer severe hunger,” said Mvula. Kayerekela Mine: Centre of controversy. 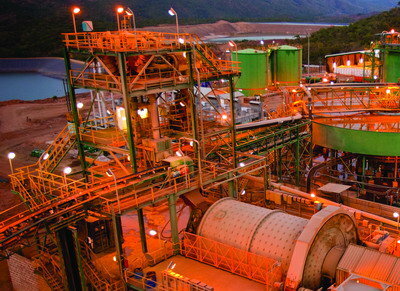 He projected a recurrence of such a trend unless current mining laws are reviewed. “The mining laws are to blame. Unless they are changed people will still be subjected to such torture and Malawi will never benefit from its mines,” he said. A recent visit by Malawi24 to Kanyika area in Mzimba found that people face hunger and have problems to access safe water, just like before the mine started. They said authorities stopped them from using anything close to the mine because it is now a restricted area. “They are keeping us waiting for them. We will do nothing as advised,” complained Violet Nkosi, one of the victims. The locals also told Malawi24 that the company is not giving them what they deserve claiming it only promises more but does less on the ground. “We thought its coming will transform our lives but we are still living a pathetic life. We are not benefiting from this mining,” complained one resident. Records seen by Malawi24 indicate that as of 2012 the company contributed only $48 million to Karonga and $9.6 million to Malawi tax base. Govt to amend grade reference bill Government has promised Malawians that it will make sure that it amends the grade reference bureau bill in the next sitting of parliament which will provide people with resources to buy brand new cars. Minister of transport and public works Francis Kasaila confirmed the development during the opening of referent spare parts outlet at Toyota Malawi. Kasaila said new cars are key to environmental conservation and in the next sitting of parliament they will make sure that the grade reference bill is amended. “New cars are a key to environmental conservation as second hand cars produce fumes that are hazardous to the environment,” said Kasaila. He further said that the private sector should come up with ways of accommodating the majority of Malawians saying if they cannot afford to buy new cars companies should make them available and affordable. “We are making sure that if a Malawian is working he or she must have access to loans and be able to buy a new car,” he said. On his part Managing Director of Toyota Malawi Arvender Reel said his company is committed to help in the transport sector and they are going to provide excellent services to all Malawians. Not Malawians bit you wished yourself to benefit first! Yes we can have access to those loans ,but first look at the gap between the salary which workers are earning and the price of those brand new cars.eg a Pt4 teacher gets a salary of K70,000 a month, a brand new car is K10,000,000. How many years can this teacher manage to pay? The problem lies in the hands of Government ,in Zambia they have towns within mines Eg ‘Kitwe ,Ndola etc ,eg the government can say within your mine we want you to build ,one hospital,one primary school,one secondary school, a recreation centre a simple water board eg like the one at Mangochi ,with that the country will benefit.THE PROBLEM WITH THESE POOR COUNTRY YOU WILL FIND SOMEONE WILL NEED HIS PALM OIL INSTEAD OF THESE MENTIONED. So whats the connection between mining and brand new carz?